The A1120 and A1125 Hall-effect, unipolar switches are extremely temperature-stable and stress-resistant Sensor ICs, especially suited for operation over extended temperature ranges to 150°C. Superior high-temperature performance is made possible through dynamic offset cancellation, which reduces the residual offset voltage normally caused by device overmolding, temperature dependencies, and thermal stress. Each device includes on a single silicon chip a voltage Regulator Hall-voltage generator, small-signal Amplifier chopper stabilization, Schmitt Trigger and a short-circuit protected open-drain output to sink up to 25 mA. An on-board Regulator permits operation with supply voltages of 3 to 24 V. The advantage of operating down to 3 V is that the device CAN be used in 3 V applications or with additional external resistance in series with the supply pin for greater protection against high voltage transient events. For the A1120, a south pole of sufficient strength turns the output on. Removal of the magnetic field turns the output off. The A1125 is complementary to the A1120 in that, for the A1125 a south pole turns the output off, and removal of the magnetic field turns the output on. Two package styles provide a magnetically optimized package for most applications. 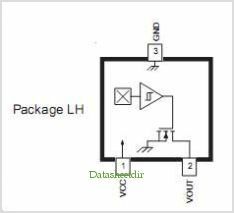 Package type LH is a modified SOT23W, surface mount package, while UA is a three-lead ultra-mini SIP for through-hole mounting. Each package type is lead (Pb) free (suffix, –T), with a 100% matte tin plated leadframe. By Allegro MicroSystems, Inc. This is one package pinout of A1125,If you need more pinouts please download A1125's pdf datasheet. 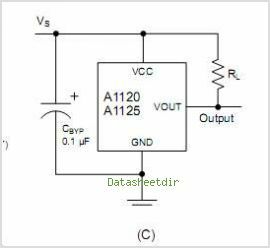 This is one application circuit of A1125,If you need more circuits,please download A1125's pdf datasheet.